The left main coronary artery (LMCA) supplies the majority of blood to the left ventricle. This fact alone explains why untreated obstructive LMCA disease is associated with a poor prognosis. Coronary artery bypass grafting (CABG) has a clear indication with a proven mortality benefit and it has been conventionally regarded as the gold standard treatment for LMCA disease. However, thanks to evolving technologies and technique, trials have progressively supported the alternative use of coronary stents in certain patient subsets with LMCA disease. In left main disease particularly, stringent technique is essential to obtain an optimal and durable result. Rigorous procedural planning, application of appropriate procedural imaging and lesion preparation together with careful patient-selection, are crucial in LMCA intervention. 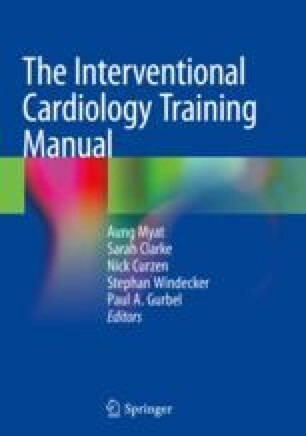 The aim of this chapter is to guide the reader through the main aspects that need attention when dealing with LMCA disease and provides a practical algorithm to apply in the catheterization laboratory.